Snow has finally come to the Midwest and I can’t think of a better way to welcome it than by curling up by the fire with a cup of hot cocoa topped with these homemade marshmallows. They were a bit of a sticky mess but a fun sticky mess. And they tasted delicious. Light and fluffy, coated with powdered sugar, they are delightful on their own and melt perfectly when dropped into a cup of steaming hot cocoa. I flavored mine just with vanilla but you could really make any flavor of marshmallow you can think up. I’ve seen Baileys and raspberry, peppermint would be delicious and I’m intrigued by the idea of cinnamon. Whatever the flavor, the texture is spot on, and I’m excited to come up with more marshmallow/hot chocolate combos. It’s time to get creative. Luckily I’ve already bookmarked some great inspiration. 1. Combine the gelatin and 1/2 cup of cold water in the bowl of an electric mixer fitted with the whisk attachment and allow to sit while you make the syrup. 2. Meanwhile, combine the sugar, corn syrup, salt, and 1/2 cup water in a small saucepan and cook over medium heat until the sugar dissolves. Raise the heat to high and cook until the syrup reaches 240 degrees on a candy thermometer. Remove from the heat. 3. With the mixer on low speed, slowly pour the sugar syrup into the dissolved gelatin. 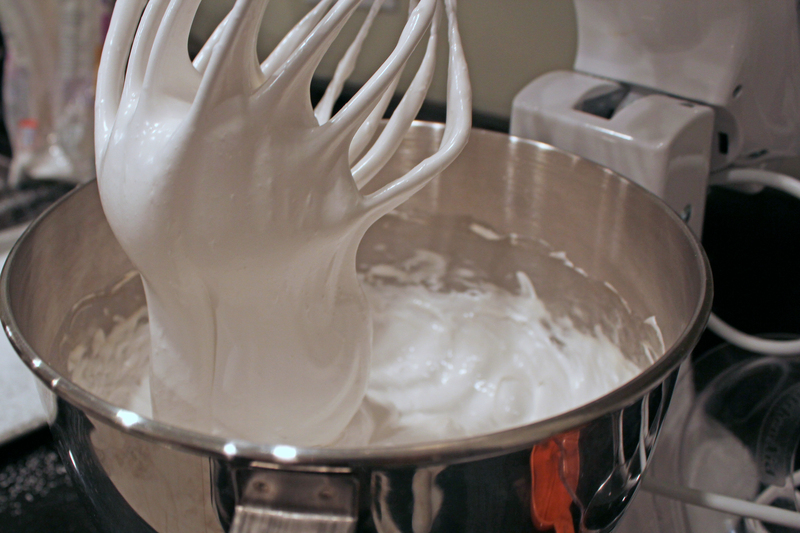 Put the mixer on high speed and whip until the mixture is very thick, about 15 minutes. Add the vanilla and mix thoroughly. 4. Line a 8 by 12-inch baking dish with parchment paper. With a sieve, generously dust with confectioners’ sugar. Pour the marshmallow mixture into the pan, smooth the top, and dust with more confectioners’ sugar. Allow to stand uncovered overnight until it dries out. 5. Turn the marshmallows onto a board and cut them in squares. (I used a pizza cutter for this and it worked well). 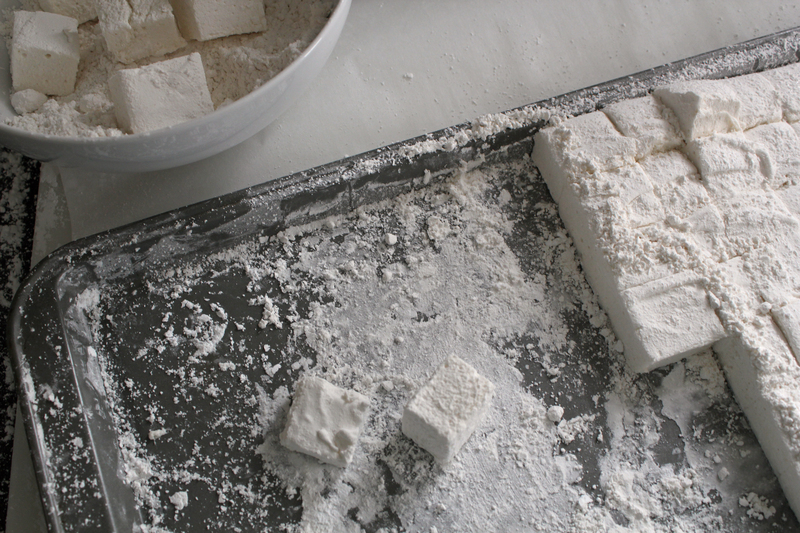 Fill a shallow bowl with confectioners’ sugar and toss the cut marshmallows to coat with sugar. Store in an air-tight container up to 3 weeks.